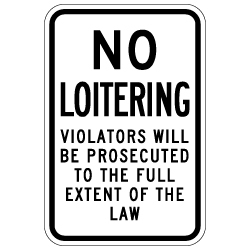 DOUBLE the working life of your Reflective No Loitering signs by adding 3M Protective Overlay Film (POF)! 3M’s high-tech POF protects sign faces against fading caused by the sun and harsh weather—and makes graffiti and sticker defacement damage easy to clear away without harsh abrasives. We Make Official Speed Limit Signs, Parking Signs and Custom Signs, and Other Signs for Property Management: ADA Compliant Access Signs, No Parking Signs, Handicap Parking Signs, No Trespassing Signs and Video Security Signs, Custom Signs, Bilingual Signs, Do Not Enter Signs, Parking Signs , No Smoking Signs, Entrance and Exit Signs.